MISERY INDEX Stream New Song, "The Choir Invisible"
Death Metal extremists MISERY INDEX have premiered the lyric video for their brand new song, "The Choir Invisible". The track is the third single from the band's forthcoming album, Rituals of Power, which is due on March 8 via Season of Mist. "The Choir Invisible" can be heard below. 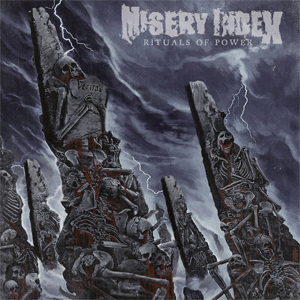 MISERY INDEX comment on the track: ""The Choir Invisible" is a euphemism for the dead, or those who have passed on. In the context of this song, it is an anthem of the dispossessed and the hopeless. Many across the world exist in an ‘in-between’ state that is often ignored and/or washed over because they lack the power and voice to plead their case as human beings. The song takes up this theme and tells it from the somber view of those who risk their lives, board ships and cross oceans in order to find a better life." Rituals of Power will be available in CD jewel case, deluxe CD digibox with extras, cassette, and various colored vinyl formats. The artwork, which is created by Raphael Gabrio, and track details of Rituals of Power can be viewed below. The band comment on the album: "Rituals of Power is a disavowal and warning against the consequences of our so-called 'post-truth' age. Each of the 9 songs revolves loosely around this theme, yet each track also stands very much on its own. As an album however, they are all brought to life as one ‘reanimated’ monster; it’s roughly 35 minutes of unhinged, yet cohesive, riff-driven aural ballistics. We were pissed off and on fire during both the writing and recording, and we think it shows in spades. We set out to write the best album we could, based on what we would want to hear first as fans of this music, and we could not be happier."